Skyworth announced that it will soon launch its first 4K OLED TV in the Chinese market, with plans to sell 30,000 units by the end of the year. Skyworth introduced those TVs back in January so it's great to see them actually preparing to ship those soon. Konka is also planning to launch their first 4K OLED - and they will start offering the first TV on October 1st. Konka says that their 4K OLEDs will only cost twice the price of 4K LCDs, so now is the time to start introducing those new OLED TV to the market. 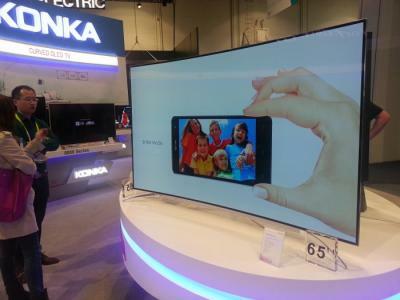 In CES 2015 Konka introduced their first 4K OLED, the 65" 65X90PU - an Android based TV. Maybe this TV is the one Konka will start shipping next month. 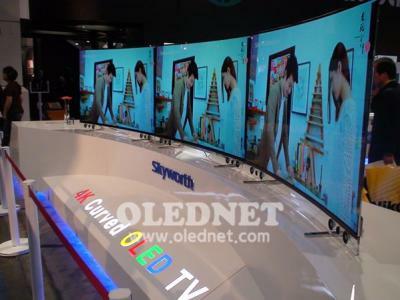 Both Skyworth and Konka are using LG Display's WOLED panels. LG Display has been supplying OLED panels to Chinese TV makers since 2013. HiSense, on the other hand, is pursuing ULtra-LED TVs - which are enhanced by quantum dots (similar to Samsung's SUD TVs). HiSense believes that the future of TVs is not OLEDs but laser-based TVs. I am surprised the TVs are so dark. Was this intentional? Can't imagine this making a good impression to persuade buyers to go for OLED. It's obvious this is just a bad photo by a bad photographer who doesn't know his trade. If you've seen an LG OLED in real life you wouldn't complain about dark.